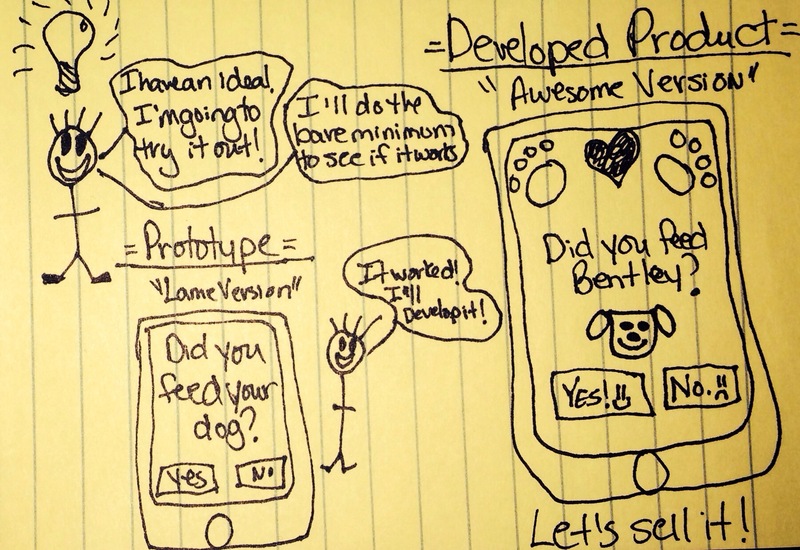 So my daughter asked me what a prototype was. It was a little tricky to come up with a quick explanation since prototypes can range from a block of wood carried in your pocket (I’m looking at you Jeff Hawkins) to a nearly minimum viable product version of an app. After giving it some thought I decided that in kid language, prototypes are kind of lame samples of your idea, used to see if your idea makes sense/will work or not. If it works you invest the cash and time into the concept to fully develop it. If it doesn’t work, no harm done because you didn’t waste an exorbitant amount of time or money on it. Fantastic goods from you, man. I’ve understood your stuff previous too and you are just too fantastic. I really like what you’ve acquired here, certainly like what you’re saying and the way in which you say it. You make it entertaining and you still take care to keep it wise. I can not wait to read far more from you. This is actually a terrific web site. To me a prototype is what you build out of lego. You could fashion your work of art by carving it from from a rare hardwood and marble. Instead you use the bits you have lying around and once you’ve proved, or otherwise, your idea you put the bits back and keep them for the next prototype.